“Who do you say that I am?”—Jesus Your answer determines everything. Interestingly, this question was for Jesus’ disciples, not unbelievers. Who we say Jesus is doesn’t always match who he actually is (Mt 16:13-20). 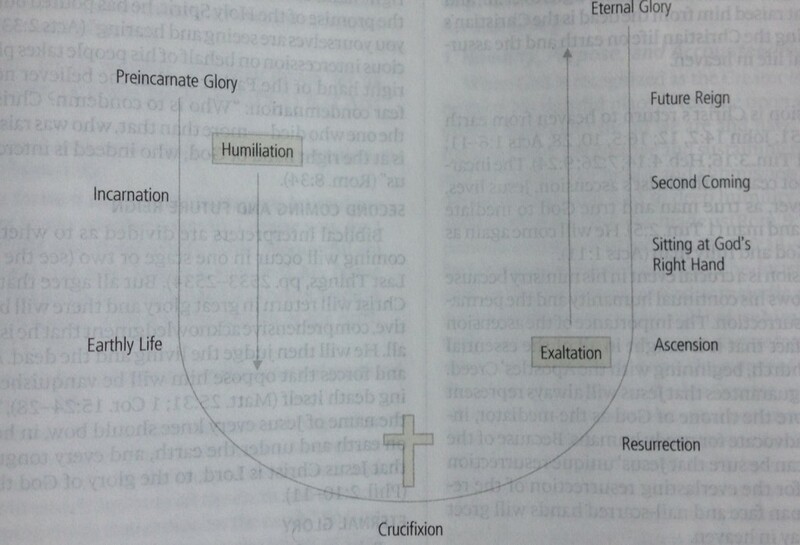 The limited Christology found in most Christian theology is intriguing, and in my opinion points towards the need for an “Honor Christology.” The ESV Study Bible (p. 2525) has this helpful visual explanation of Jesus’ life. This picture uses height to trace the “life story” of Jesus. He begins in glory, descends to the cross, then is exalted to eternal glory. The honor-shame dynamics of this graphic are unmistakable. The U-shaped movement follows the status of Jesus life—great honor, great shame, an then even greater honor. These 10 stages, divided into a humiliation phase and an exaltation phase, captures the theological meaning of Jesus life as a whole. But unfortunately, Christian theology commonly separates the historical life of Jesus (as pictured above) from both the person and work of Jesus. The actual events of Jesus’ life hardly shape our Christology. Christology (i.e., our theology of Jesus Christ) typically involves two aspects: the (1) person and (2) work of Christ. The person of Christ is usually defined ontologically as “fully man, fully God, one person.” The historic councils defined the person of Christ ontologically (and then modern Christians assume the NT term “Son of God” is shorthand for all these ideas.) And second, the work of Christ is typically defined as “penal substitution”—Jesus’ endured God’s wrath and paid the penalty for our sins to satisfy the demands of justice. So, the gospels stories get read as either (1) proof of Jesus’ divinity, or (2) an explanation of how he forgives sins. As an evangelical Christian, I obviously affirm the deity of Christ and his atoning work to forgive my sins. But settling for only those truths may limit other aspects of who Jesus really is. Consider this fact: Jesus’ teaching, miracles, table fellowship, conflicts, or anything else during his life are barely significant in such a theology of Jesus. Because our Christology is separated from the complete life of Jesus as presented in the Gospels, most Christians struggle to read the gospels theologically. The events in Jesus’ life get reduced down to general aphorisms and moral examples. We have little framework to structure the meaning of the individual parts. Shouldn’t these elements of Jesus’ life inform our understanding of who Jesus is (person) and how he saves (work)? This points to what I identify as an “Honor Christology”—a theological interpretation of Jesus Christ’s life that properly accounts for the honor-shame dynamics inherent in the original setting and biblical texts. How does Jesus Christ reveal and restore God’s honor? I believe this guiding question holds theological promise for understanding the entire life Jesus Christ.An “Honor Christology” captures how Jesus is honorable (he rightfully receives and possesses honor) and honoring (confers honor to others)–the embodiment and essence of honor. In the final sentence of “The Weight of Glory,” C.S Lewis refers to Jesus as “the glorifier and the glorified, Glory Himself.” While Lewis does not flesh out this Christology, his categories suggest fresh directions. The U-shaped image of status reversal not only depicts the life of Jesus. It also depicts the very nature of salvation that his life accomplishes—status reversal, from shame to honor. The honor-shame-honor movement is hardly unique to Jesus. This is the story of God’s people. It is the story of Adam—the first Adam, the second Adam, and every other human. Jesus as the second Adam rewrote the narrative of humanity. This is ultimately the story of every person in Christ. Jesus represents the entire group—what is true of Him, is also true of us. The meaning and efficacy of Jesus’ life is integrally bound by the very life he lived. Jesus’ life was not just the means of our salvation; Jesus’ life is also the model of our salvation. Is Jesus an “Honored Ancestor”? (with response from Martin Munyao). Did Jesus really loose his honor? or was He “on assignment” and did that entail becoming human and living a lowly life? I know that Philippians 2 says that Jesus humbled himself to the position of a servant. But my questions are wether the Father viewed Him as less honorable during his life on earth and his being human, and wether Jesus viewed it as living in “shame”. Excellent post. When it comes to honor/shame theology, there isn’t a more valuable exploration in the Scriptures than the study of the honor-status reversal of Jesus Christ. You are adding theological depth to what I have written concerning honor-status reversal as a motif of Scripture. http://wernermischke.org/2013/01/18/reversal-motif/. This reversal is epitomized by the incarnation, death and resurrection of Jesus in Philippians 2:5–11. Thank you, Jayson, for the richness of your post. Looking forward to the follow-up posts! In the tradition of my church (Netherlands Reformed-Liberated) there is a strong tradition the stress the line of ‘through suffering toward glory’ – although we did not use the word honor/shame. Also this plot was recongnized as prefiguration in the stories of Abraham, and esp. Jacob, Moses (and Israel), David, and the exile. God is always working along that line. So, I feel affiliated to your ‘Honor Christology’ without (originally) knowing about H/S culture. Now, the two come together. Thank you for your contribution. In my sermons I try to use yout insights, working in South-Korea, pretty much indeed: Shame-culture. I worked for 20 years as a resident missionary in an oral tribal culture in Papua, and continue (20 years later) to have occasional teaching visits there. During my time in this culture my systematic theology had to begin to be rethought and my approach became more like a biblical theology through narrative and in metaphors they understood from their context. The atonement is an example, because the common Protestant position in the west of penal substitution reflects the context in which it was formulated, and actually pays little tribute to the rite of the atonement in the OT. The people also understood shame and danger rather than guilt and penalty. I am still exploring the issue of honor (glory) in that context, but I think it does apply in atonement, because the covering of sin removes the barrier to the presence of God (the face of God) and restores honor to the Israelite worshiper. And I think Jesus did willing lose face/honor when he humbled himself and became obedient to death and bearing shame on the cross; from which God exalted him, and through his resurrection he exalts us to share in his glory. I am not ready to write a paper on this, but following the posts on Honor and Shame, I may one day find the time and the words to do so.